Crafted from an elegant European Design, this shower head is perfect for those wanting the freedom of a hand held shower and the convenience of a wall mounted shower all in one! 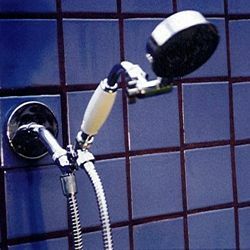 This shower can either attach to the wall or operate in your hand. Comes with our ADS Showerhead.